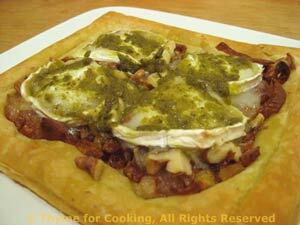 Caramelized Shallot and Goat Cheese Pastries, Thyme for Cooking easy starters. The sweetness of the caramelized shallots and onions is perfect against the slightly sharp flavor of the goat cheese. Walnuts are a traditional pairing with the cheese. 3oz (90gr) goat cheese - You don't want the creamy kind in the carton for this but a proper goat cheese: log-shaped and wrapped in paper. It will have a thin, whitish, rind that is edible. Heat oil in medium nonstick skillet over medium heat. Add shallots and sauté until they start to get transparent and tender, about 7 minutes. Turn heat up and cook, stirring, until they start to get brown, about 5 minutes. Lay out puff pastry and cut two 4 X 5 inch rectangles (10 X 12cm). Lay the cut pastry on a baking sheet. With a table knife, score a line around the edge of each pastry, about 1/3" (1cm) from the edge. Divide the caramelized shallots and spread to the scored lines. Sprinkle the chopped walnuts on top of the shallots. Lay the goat cheese on top, cutting smaller slices, to roughly cover the shallots. Spread pesto on top of goat cheese, dividing evenly.